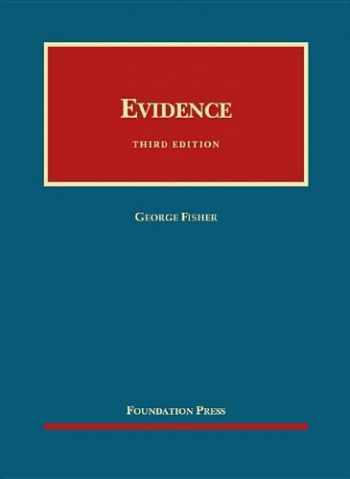 Acknowledged author George Fisher wrote Evidence (University Casebook Series) comprising 1152 pages back in 2012. Textbook and etextbook are published under ISBN 1609300602 and 9781609300609. Since then Evidence (University Casebook Series) textbook received total rating of 4 stars and was available to sell back to BooksRun online for the top buyback price of $77.93 or rent at the marketplace. Prompted by mounting changes and mounting confusion in constitutional evidence law and by the new restyling of the Federal Rules of Evidence, this edition presents the familiar student-friendly textbook, now with these improvements:Presents and digests the latest Confrontation Clause caselaw, including Williams v. Illinois, 132 S. Ct. 2221 (2012);Fully incorporates the restyled Federal Rules of Evidence;Surveys the latest scholarship and caselaw to assess the current validity of a range of forensic sciences;Presents new cases and problems throughout, while carefully retaining tried-and-true teaching tools, however old, that have shown no sign of wear.As with past editions, this new text addresses the intricacies of evidentiary law in a way students will find both engaging and intellectually compelling. The casebook and accompanying rulebook are wholly integrated, with paginated cross-references that encourage students to consult legislative history.